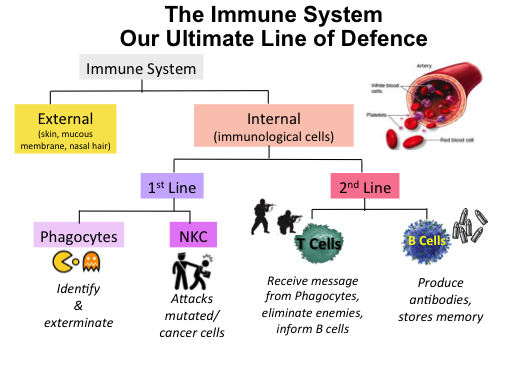 Our immune system is a network of organs and special cells that help protect our body from infections and diseases. Our first barrier from infection is our skin, which prevents pathogens, viruses and bacteria from going into our bloodstream. There're a lot of immune cells inside our mucous membrane (the slimy layer in our mouth and digestive tract), because a lot of pathogens are introduced into our body through food we eat. The food may be contaminated. It is these immune cells that help us fend off those pathogens. We also have organs like tonsils, thymus, spleen, appendix, bone marrow, lymphatic vessels and lymph nodes. 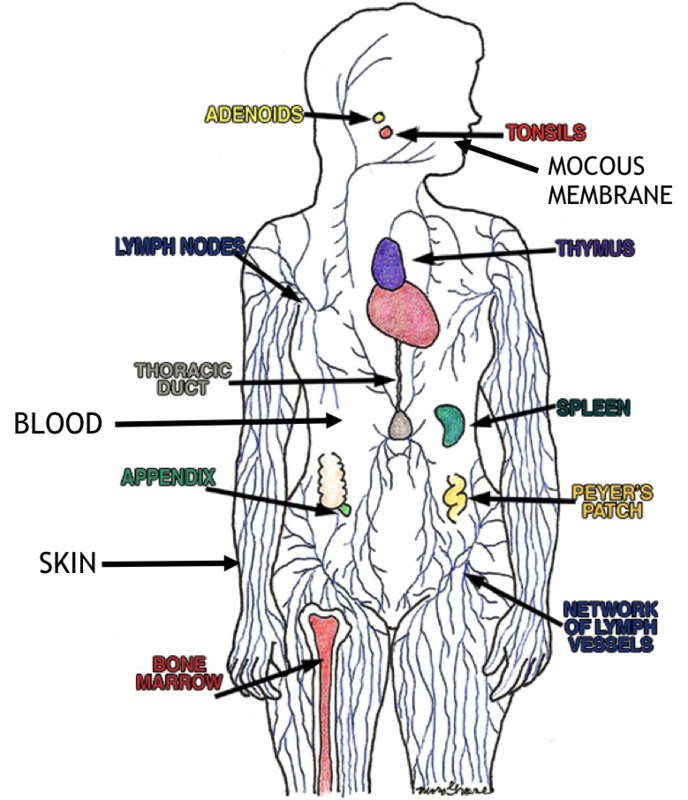 There're over 600 lymph nodes in our body, mostly concentrated in the armpit, groin and neck area. If you have infections, the lymph nodes will be swollen. (i) Phagocytes, which identify and exterminate pathogens that come into your bloodstream. If your Phagocytes are strong enough, they will settle any infection at this point so you won't even feel that you're sick. 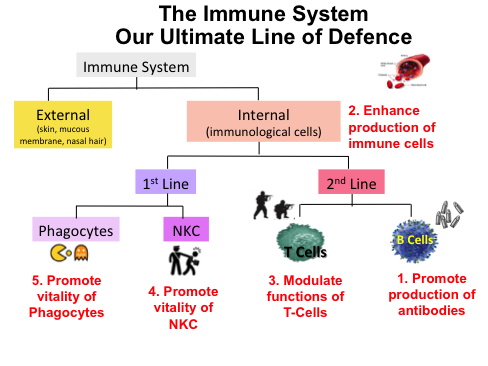 (ii) Natural Killer Cells (NKC), which attack mutated or cancerous cells. Our body generates many cells every minute of the day and some may be deformed, defective or mutated. If NKCs are not able to catch these cells early enough, given certain conducive environment, they may turn cancerous. So NKCs are your body's natural ability to fend off cancer. E.g. the policemen taking the petty criminals away instead of leaving them in the street to commit further crimes to hurt us. (i) T-Cells, which are the soldiers who will go into battle to fight the enemies. (ii) B-Cells, which are the factory producing weapons that will be given to T-Cells to fight. They also store in memory whenever an infection is successfully fought; which weapon is used for which enemy. For example, if you had chicken pox before, it's unlikely you will get chicken pox again because you already have the antibody for it. B-Cells also play an important function to tell the T-Cells (army soldiers) when to retreat. When the war is over and enemies are killed, the armies are supposed to retreat. If they continue to be in battle mode, they will start killing off the healthy cells. This will cause a condition called auto-immune, where the immune cells attack the healthy cells. What Can Go Wrong With Our Immune System? Immune system disorders can cause abnormally Low-Activity, where all your immune cells are slow to react, or a case of Over-Activity, where the T-Cells keep on attacking and don't know when to stop. If you have low immunity, you fall sick very easily and very frequently, or you recover much slower than most people where you have to see the doctor a few times. For severe cases of low immunity, you may get cancer. If your NKCs are very weak and you're genetically weak in certain areas, your chances of developing cancer will be higher. You need to boost up your NKCs. 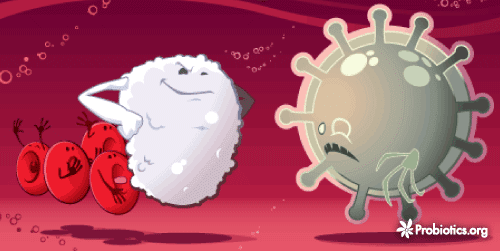 If you have over-active immune system, your immune cells will be attacking healthy cells in your body. If it attacks your joints, you will have a condition called rheumatoid arthritis, causing severe inflammation and pain in your joint area. Or they may stimulate your skin cells to over-produce, resulting in a condition called psoriasis or eczema. You get asthma or bronchitis when they attack your respiratory system. You may get allergies to food or medication like paracetamol or bee stings. When you're under stress, your body produces a lot of adrenalin, which will over-stimulate your digestive system. Your stomach will produce a lot of gastric juices. You start to feel very irritable and a lot of discomfort. So you won't have appetite, you don't eat and end up with a lot of gastric juice that will damage your mucous membrane. As your mucous membrane has a lot of immune cells, this will lower your immunity. When you breath in a lot of dust particles or chemicals (e.g. if you work in a chemical factory or as hairdresser), it can cause your immune system to spring into action. These chemicals can seep into your blood and cause you allergies. c) Bacterial or viral infections like HIV. d) Drug therapy or surgery which kill off a lot of healthy cells, including immune cells. e) People who have undergone organ transplant are on long-term immuno-suppressant drugs to prevent the body from rejecting the organ. But it also suppresses their immune system so they tend to succumb to infections more frequently. This has to do with our lifestyle and food. If you regularly take a lot of fake food, junk food, fast food and dead food, you don't expect your immune system to be very healthy. As we age, a lot of our systems deteriorate, including our immune system. Mostly the treatments are Symptomatic, with the objective of decreasing the symptoms. For example, if you have wheezing, doctors will give you nebulizer and steroids to open up the airways so you can breath better. If you have rashes, doctors will give you cortisol cream to apply. The rashes may disappear but they will come back again. avoid known triggers of flare-ups. Unfortunately, these treatments don't address the Causes, only the symptoms. Lingzhi can help to modulate your immune system - boost it up so you don't fall sick so often and at the same time, calm down the allergy reactions. Lingzhi also helps to improve your blood circulation, so the immune cells can circulate better all over your body. Helps promote the production of antibodies. Helps enhance the production of immune cells - when you fall sick, your immune system can very quickly generate the weapons (antibodies) and soldiers (T-Cells) to fight the enemies and help you recover faster. Helps modulate the functions of T-cells - alleviate your allergic conditions, reduce the severity and frequency of allergy attacks and if you take at sufficient dosage for appropriate duration it may even inhibit the allergic reactions. 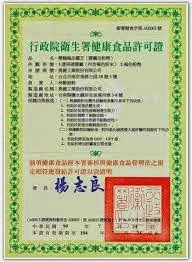 Helps promote the vitality of natural killer cells - make your "policemen" more alert and more hardworking to circulate around more so they are able to catch the mutated cells more effectively. Helps promote the vitality of phagocytes - you won't fall sick so frequently. From the above, the accreditation confirms that Yung Kien Ganoderma can effectively take care of your whole immune system. 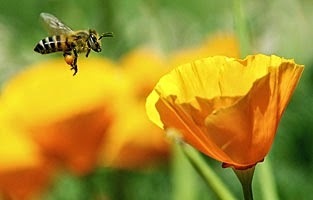 Pollen is the most complete and nutritious food after mother's milk. Many medical researches have shown that if you're deficient in even one vitamin/mineral, your immune system can be depressed. Yung Kien Pollen has more than 16 types of vitamins, 16 minerals, 21 amino acids, 28 nucleic acids and 94 enzymes/coenzymes. For your body to be able to produce good immune cells, it uses a lot of vitamins A, C, E, B5, B12, folic acid, iron, selenium and zinc. You need a lot of enzymes and coenzymes to be able to utilise all these vitamins and minerals more effectively - a synergistic effect. Hence Yung Kien Pollen is recommended, because everything that's needed is in the pollen. It's convenient, natural, wholesome, complete, safe, active/alive and easily absorbed and utilised. There are 100 trillion bacteria residing in each of us and 85% of it should be good bacteria for optimal health. Our digestive tract is responsible for 80% of the immune system. Our intestines is about 30 feet long and the skin surface is about 150 times more than our external skin. As it's a big surface area, the exposure to pathogens is more. Our digestive tract's mucous membrane is packed with immune cells. For you to keep your digestive tract healthy, you need to make sure your mucous membrane is intact and ensure you have a lot of immune cells. The easiest way to do that is to supplement yourself with a lot of friendly bacteria. Because these friendly bacteria in your gut will produce a lot of vitamins especially B12 that is needed to build immune cells and happy hormones (which can help counter the stress that causes your immune system to go haywire). The probiotics help inhibit the growth of bad bacteria, help you to digest your food properly and enhance the absorption of nutrients. After the digestive tract digests your food, it is supposed to allow nutrients from the digested food to be absorbed into your blood but prevent pathogens from going into your blood. How does it do that? The friendly bacteria makes a lot of lactic acid which feeds the mucous lining. Only if you have a very thick mucous lining, then you will have a lot of immune cells there. If your mucous lining is very porous and your digestion is not good, it's very easy for partially digested food to permeate your digestive tract and go into your bloodstream. Then your immune cells will attack this unknown element and cause a condition called food allergy. By keeping your mucous lining very thick, having enough immune cells and at the same time, and if your food is properly digested, then your incidence of food allergy will be reduced by a lot. Recommended dosage: 4-6 sachets Lactoberry a day. Immune cells are made of protein. 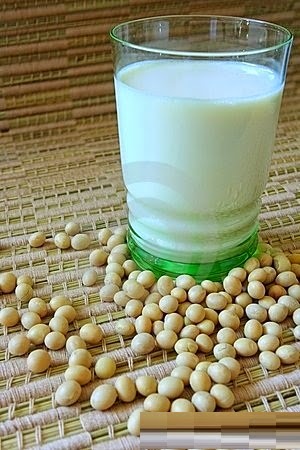 Jia Hor Soya Protein is an excellent source of protein to rebuild all your cells, including your immune cells. Protein also helps to counter stress. When you're under stress, you have a lot of adrenalin pumping in your body, your metabolism jacks up and depletes your body's content of vitamin C and protein. Hence you'll feel very tired and low in energy. Also, when you're stressed, you have a lot of gastric juices, your tummy doesn't feel well, you don't feel like eating, your tummy is empty, the excess gastric juice will harm your mucous membrane and immune cells. You need to rebuild your immune cells. So you need to intake sufficient protein everyday in order to replenish your protein content, as our body cannot store protein like it stores fats. Protein can give you better energy and stamina and maintain strong and healthy physique. 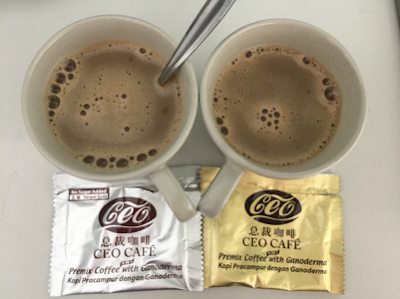 Recommended dosage: 4-6 sachets Jia Hor Soya Protein a day. If you're seriously looking into something to take care of your immune system or if you've a certain immune-related condition that you want to address, I urge you to come and explore more on Shuang Hor products, to find out how can our products help you to manage your immune system and your health condition. Please email me at askfuiping@gmail.com to purchase Shuang Hor products. I am an Authorised Distributor. Click here to refer to Shuang Hor company website for Product Description and Price.